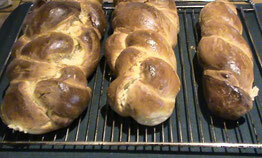 Recipes - maxwell437s jimdo page! 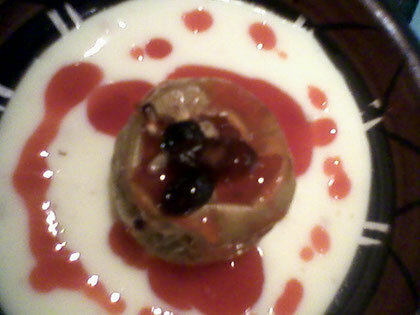 End of June you will see more new created recipies with pictures and theyr preparation methods. New creation of recipies will take time, but you will have fun to prepared yourself. Take fresh rosemary stalks, remouve leafs. 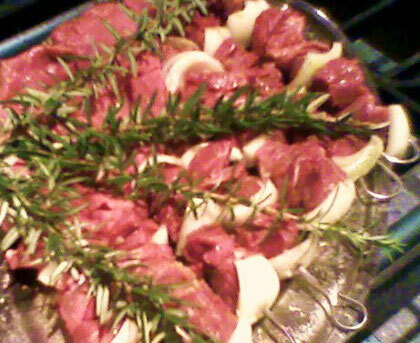 Use the stalks from the fresh rosemary and stick the meat cubes onto. Marinate the meat-skewers in olive oil, sea-salt (grinded) and freshly grinded black pepper and finely chopped garlic to your liking. I prefer a lots of garlic with some fresh ginger mixed. While grilling the skewer on the flatt griller place somewhole rosemary twigs inbetween, to add more flavour. Serving suggestion: with a fresh asorted Salad Platter and crispy roast potatoes. Sirloin, Rolled Beef Shoulder and rolled Roast Pork. (only for pork) for all roasts add some bye leafs. Plae in a preheated oven of 220 degree C. after a while turn heat dawn to 180 degr.C. 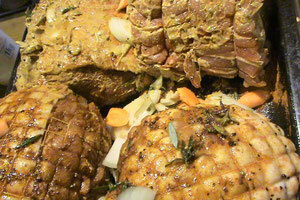 Add some water during the roast process to make gravy.